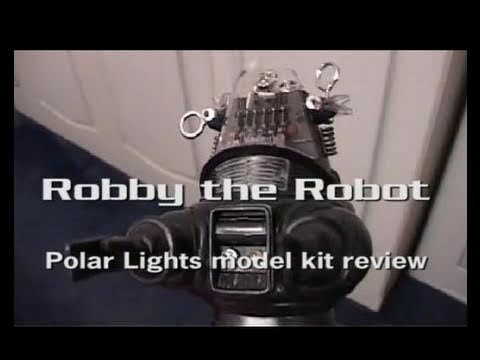 Polar Lights model of Robby from Forbidden Planet. Paint I used was cellulose Ford Levante Grey metallic. Video clips are from the Forbidden Planet movie and Lost in Space (LIS) TV series 1 in which he played a Robotoid. I recommend these to people. Of course Robby was in loads more too. This kit cost me £25 in the UK in 2010. Main thing to do is sand down the joins on the legs and body. The head details are a little tricky for the beginner. Otherwise easy. When gluing the head transparency I would say just add a touch of glue at the rear only as this will hold it, otherwise you might spill glue all over the piece. He has an option for his hands to convert them into grabs. His front panel is optional too so you can make him as the Robotoid from LIS. For reference use Fred Barton’s web side for close up shots of the head. These shots seem accurate to me compared to the film. This will tell you what pieces in the head are red, white, silver, gold, and remember to paint his ‘eyes’ with a touch of blue. The side silver bits under the ‘ears’ are meant to be coils, so paint them accordingly. Use the film or web site to judge the angle to glue the white ion modulators. The gyros should be clear but are chrome parts in the kit. These look good enough but if you are really keen you might want to fabricate your own. I made the kit as is. There is room inside and under the base to add lights, or a mini sound system even. But I made mine with the kit parts just as a static kit. I guess you could also get the little sample door on the front to swivel open. Get his arms to bend etc so you choose where to stop. Quite simply a wonderful model kit. MCPS licence 5965 for copyright purposes. Search ‘Calvertfilm’ on the internet. I ahve the same kit, very detailed like the actual movie prop… also have one of the Hallmark Christmas ornament miniatures and the miniature replica that came with the 50th Anniversary Video release on DVD in the metal box! Now, here’s a real clincher… did anyone know that they can build a FREE paper replica of Robby? Search for it on your browser! Once you discover how to obtain it, you will be amazed at its intricate detail and likeness to the plastic counterpart kits! @gusisgr Bit of both. I stuck some part together, such as the legs, sanded the joins, and then painted them. I stuck and sanded the body, then painted that. Then stuck the pieces together after that. This is a great video! Just a small question, did you build the kit then paint him or paint all the parts first then build him? I have that model I’m excited to build it.